Hi all. In this first post I'm going to show some guys that are (more or less) finished. I also have Ivanus Enkomi painted up, but I kind of dropped him on the ground, so he needs repairs. Later on I'll be updating on the work in progress. What exactly will get priority largely depends on the thread in the army lists section, so feel free to visit there too and give me some feedback. Lastly, for now, some rank and file. I decided to try some snow on the base of the devastator sergeant for some contrast. I'm not convinced. With respect to the tactical marines, I tried to keep it simple and easy, so I wouldn't be spending forever just getting to a bare-bones army. But now I'm thinking they are more gold than bronze. Edited by Pimz, 17 September 2016 - 09:45 AM. Time for some work in progress. Here's the captain, he got a retributor armour basecoat, I just did the first layers on his cape, as well as getting a base of dark red (1:1 khorne red and rhinox hide) on the armour. I didn't like the double-eagle backpack that comes with the sprue, so I took a large Minotaur skull from an old fantasy banner top instead. The idea is to get the rank and file bronze with some red details on the purity seals and chapter badges. The characters and veterans will get more red in their armour. I'm still learning many of the techniques, and found out that wet layering is not easy. The land speeder is just that, a land speeder. The pilots are not in there yet. The heavy flamer is magnetised, and I can switch it for an assault cannon if I want to. I can still reach the controls well with my brush, so next time some detail shots of the interior are up. Third model here is an old metal beastmen Minotaur. He'll be a character in terminator armour, but I'm not sure if I'm going to give him weapons or pauldrons yet. He definately needs some details. Lastly, here's WIP tactical marines. I got them the invictarii heads, which should look well when finished. They have retributor gold as a basecoat, but that was really gold, so I went over that with a mixture of mainly Balthasar gold, and then a wash of thinned down Agrax earthshade. I went with yellow lenses, but I need to get some brighter yellow to make them stand out. Also, the sergeant has had his arms magnetised so I can field him with four arms vary his loadout. Edit: I should clearly work less so I can take pictures in daylight. Edited by Pimz, 17 September 2016 - 09:44 AM. Good spacing of Gold and Red. I can't see the Gold that well it looks flat but I think that's the lighting. I did some Minotaurs a while back and used a bronze drybrush to add depth to the Gold. Also use a sponge brush or sponge with stencils to get the cool white markings on the car our like the FW art it makes a difference. Keep up the good work. Thanks Noctem Cultor, good to know I'm not only posting to keep myself busy. I'll definately try a bronze drybrush. I've been working on my scouts and tacticals, to get to minimum troops and still have some versatility. I expect to use the scouts often at first, as I've only been playing small games, in the range of 500 pts. 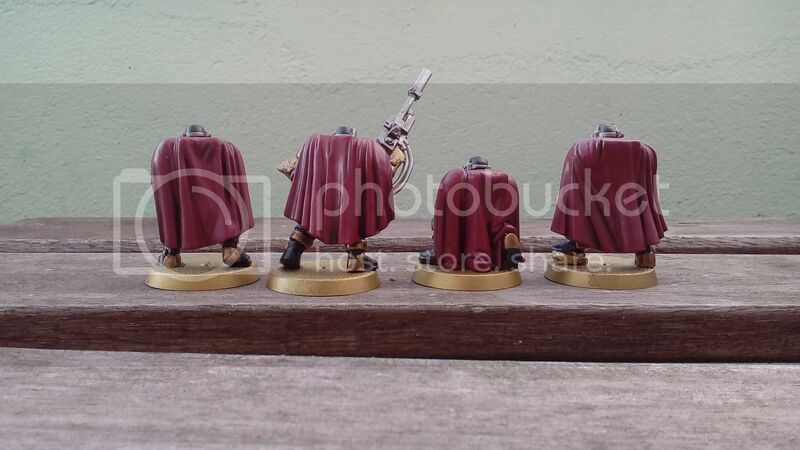 The basics on the scouts are done, their cloaks are my best attempt at blending yet. When they are dry, I'll be getting into the details. The middle scout has two options, sniper or missile launcher. In this case it was a lot easier just to use the extra torso from the box and magnetise the legs and torso instead of trying to get both weapons working on a single torso. By the way, how do I combine a picture and link in my signature? I thought it'd be simple using the tags, but somehow it's either linking to the picture or it removes the link. Could it be because I tried to use the gallery function of the forums? Edited by Pimz, 18 September 2016 - 05:14 PM. 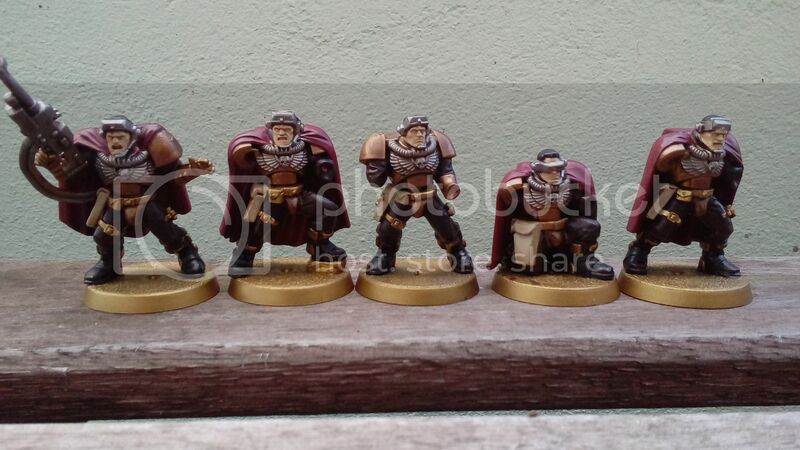 Nice clean painting on those scouts. Add the image from you Gallery into your signature (My Media button) and then highlight it and click the Link button and paste your URL link and your done.